This week’s featured posts are “Is Kim Davis a Martyr?” and “Damned Lies and Employment Statistics“. which I cover in “Is Kim Davis a Martyr?” Meanwhile, a liberal Christian imagines having the same kind of “religious freedom” conservative Christians claim. Republicans (except the ones in Alaska) are up in arms that President Obama has recognized Alaska’s name for its tallest mountain, which was also the mountain’s traditional name prior to colonization by Europeans. This shows just how irrational the urge to condemn whatever Obama does has gotten. Vox does its usual good job of providing context. One thing I’ll add is that those fleeing the Syrian civil war are giving us a preview of coming events. As climate change continues and sea levels rise, millions will be forced to migrate, most of them poor people who have no obvious place to go. According to the Bureau of Labor Statistics, the economy added 173,000 jobs in August, dropping the unemployment rate to 5.1%. As usual, this led to a chorus of denials that things are really that good, which I examine in “Damned Lies and Employment Statistics“. BLM protesters in Minneapolis chanted something that seemed to threaten police. A black man killed a white deputy in Houston for no apparent reason. The Houston sheriff connected the two, and it was off to the races. Sean Hannity and Bill O’Reilly were quick to join the chorus. And then there’s a whole subterranean layer of conservative media most liberals don’t even know about, like Infowars. So now, as far as your crazy uncle is concerned, it’s an established fact that BLM is a hate group that advocates assassinating cops: He’s heard the chant and he can name the deputy. So even if no further events fit that narrative, we’ll continue hearing it for years. Both the official Black Lives Matter organization, its representatives, and its loosely connected friends and partners actually have real agendas, real goals, real plans, and none of them, explicit or inferred, has ever suggested violence against police. … Twelve-year-old Tamir Rice was killed by police nine months ago and police and prosecutors claim to still be investigating, but days after a criminal kills a white officer, the sheriff is already making declarative statements about motive and inspiration. The double standard is thick. More clueless yet are the people pushing the “Blue Lives Matter” meme. Consider, for example, the recent shooting of a policeman in Fox Lake, Illinois. The response to that shooting — national news updates, a manhunt involving hundreds of people — is the virtual definition of what it means for a life to matter. Compare that to the initial response to Trayvon Martin’s death: Police believed the shooter’s story, gave him back his gun, and let him go home. Black teen-agers get shot every day; what’s the big deal? After protests and news coverage forced local officials to begin taking Trayvon’s death seriously, he was as much on trial as his killer. A large portion of our news media wanted to focus on whether he was a thug, whether he might have been on drugs, what he did to deserve to be shot, and so on. That doesn’t happen when a police officer dies. We don’t have a national conversation about whether the victim was a dirty cop or what past mistakes he might have made. We don’t concoct speculative scenarios to justify the shooting, and make the officer’s family prove them wrong. Not that we should, but cop deaths are the gold standard for what it means for a life to matter. What if the lives of young black men mattered like that? A South Carolina policeman recently got a one-year-house-arrest plea deal for killing a middle-aged black father. What’s that say about the relative value of their lives? It’s worthwhile for white people to spend some time thinking about how whiteness affects their relationship with the police. Here are 20 specific ways. The Iran deal is going to survive Congress. 37 senators have announced support for it so far, with four Democrats still undecided. If all four support it, a congressional rejection of the deal can be filibustered and won’t pass. But if it does pass, the 34 senators would be enough to sustain President Obama’s veto. 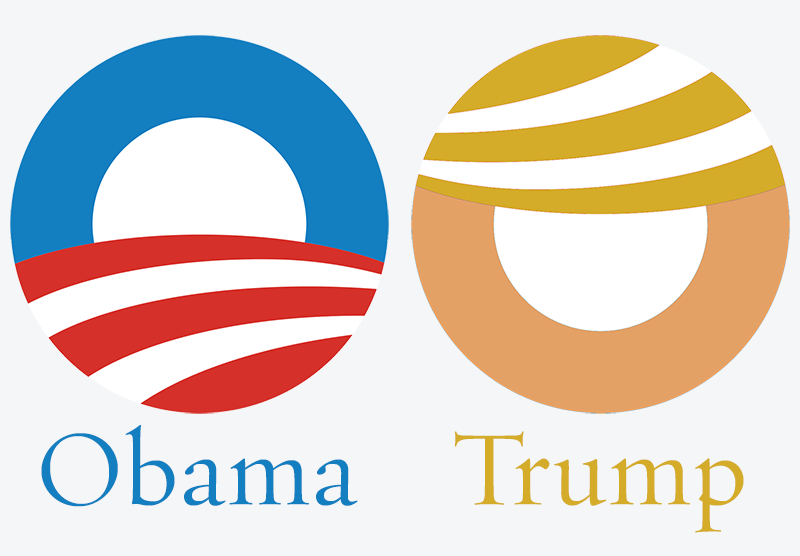 Matthew Gordon suggests a simple color-and-orientation change to make Obama’s logo work for Trump. Ever since the state Supreme Court in 2014 ordered the legislature to increase funding for education, Governor Sam Brownback and his allies in Topeka have sought to wrest power over appointments from the Supreme Court and make it easier to replace judges. The judicial budget includes a self-destruct button that would wipe out all funding for the state courts if any court halts the 2014 law reducing the Supreme Court’s authority or finds it unconstitutional. What could possibly go wrong? Well, last week a judge did strike down the law. The ruling is on hold pending appeal, so for now the Kansas courts remain open. Meanwhile, Kansas continues to have real problems, in addition to the ones created by the dysfunction of its government. John Oliver reports on the joys of lying about history. 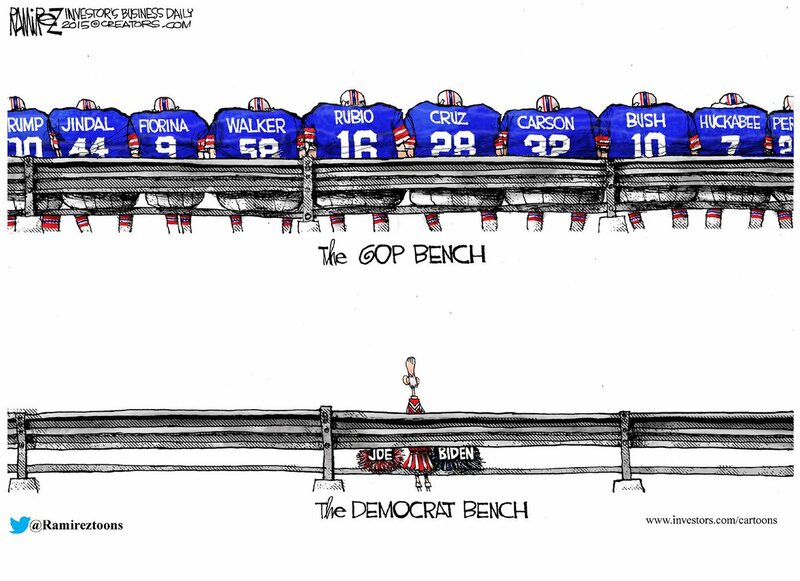 This is where Republicans have gotten: For a long time, they were bragging about their “deep bench” of 2016 candidates, as in this cartoon from just a month ago. Now, some are looking to Mitt Romney to save the Party. Willy Wonka must be one of the re-generations of Dr. Who. I mean, the Great Glass Elevator should have tipped me off: How many people have little boxes that can take them into space? OK, the “I know you don’t care” is condescending, but usually true. Republican reaction to Denali is not irrational. They want Ohio’s electoral votes more than they want Alaska’s electoral votes. This is not irrational hatred of Obama, it is manufacturing an issue in order to pander to uninformed voters, whom they have already primed with Obama hatred. Disciples of notoriously unrepentant race hustlers, such as Hannity and O’Reilly, don’t realize the context of BLM, and so need the addition of the word “too”.